Learn about ancient Mayan culture, marvel at natural wonders, and get your adrenaline pumping at the Cenote Maya Park. Rappel into a cenote, swing along Tarzan vines, cool off with a swim, and take part in a traditional Mayan blessing ceremony. Lunch is included. Make your own way to the Cenote Maya Park, 25 minutes drive from Valladolid, and use your admission ticket to gain full access to the park’s attractions. The park is open from 9am to 4pm daily, and there’s no need to pre-book your time – simply show up and join one of the experienced guides to explore the park. 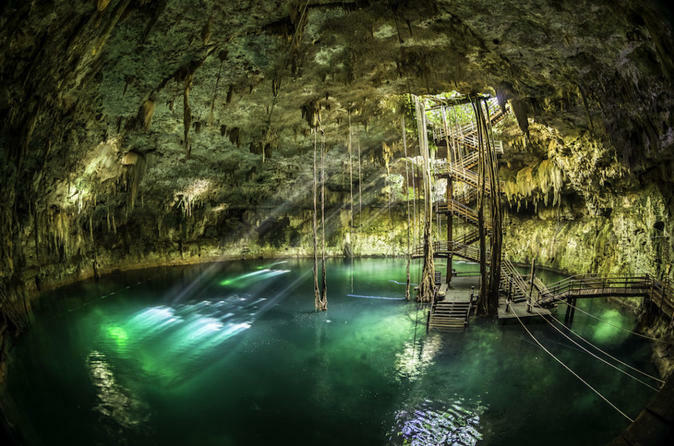 Kick off your adventure with a thrilling rappel into an 85-foot (26 meter) deep cenote, then get your adrenaline pumping as you play on the Tarzan swings or jump from 10 – 20 foot (3 – 6 meter) high platforms into the water. Spend as long as you like swimming and soaking up the scenery, then dry off and set out to explore the park’s other attractions. Learn more about the region’s ancient Mayan heritage as you visit a typical Mayan house, take part in a traditional Mayan ceremony led by a shaman, then shop for handicrafts at the market. Finally, tuck into a delicious lunch (included), prepared with fresh organic ingredients.